American Stone Cottages...The French - AND English - Connection! 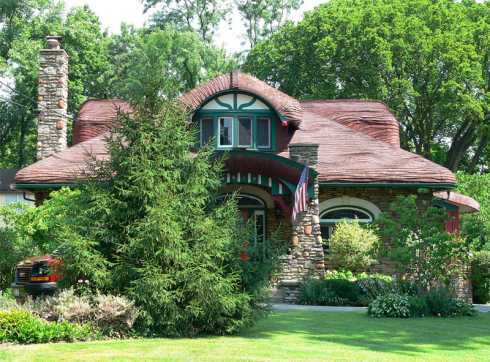 The stone cottages featured here show the profound influence European architecture -- particularly French and British -- has had on cottage design in America. Though generally not precise copies, "Americanized" versions are, nevertheless, characteristically picturesque and charming in their own right! Part 2 . . . The Journey Continues! The French Provincial cottage pictured below, left, features a steeply pitched hip roof -- typical of the style -- that is covered with slate stone tiles. Square in shape and symmetrically balanced, arch topped windows flank an arched entry door . . . . . characteristics or features that are also quite common with this style in America, giving it a rather formal appearance. 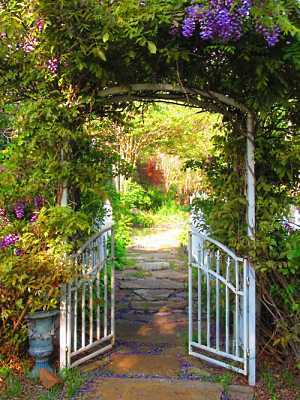 Conversely, the English cottage style has an irregular, asymmetrical shape that gives it a much more casual and informal appearance. Gable roofs and "squared off" window tops are other common features. The charming English stone cottage pictured below, right, is located in Chadds Ford, Pennsylvania, USA. Unlike most "Americanized" versions, this particular example is so authentic it appears to have been plucked from the English Cotswolds and transported across the pond to the United States! The "cottage craze" began in America shortly after World War I and continued throughout the 1920s and 1930s. American soldiers returning from Europe at the end of the war were enamored with the French -- and particularly English -- cottages they had seen while traveling abroad. The ideas and images captured in their minds were subsequently conveyed to American architects, designers and builders, who then interpreted and incorporated them in their new home designs. 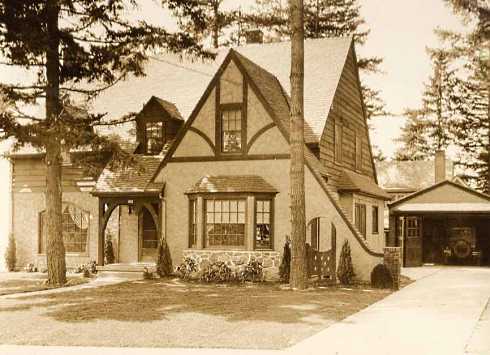 Entire subdivisions of European, or more precisely, English-inspired cottage designs, such as the example pictured below, soon dotted the American landscape from coast to coast. For a variety of reasons -- not the least of which was affordability -- stucco and false half-timbering were frequently substituted for stone on the exterior. However, affordability was not always the primary reason for substituting materials. Given Britain's lengthy history, architectural styles changed over the centuries . . . and then were subsequently revived. 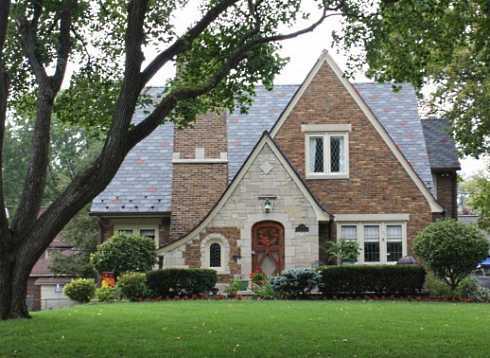 For example, Tudor Revival architecture -- both in England and America -- frequently employed a variety of materials, including stone, brick, stucco and half-timbering. 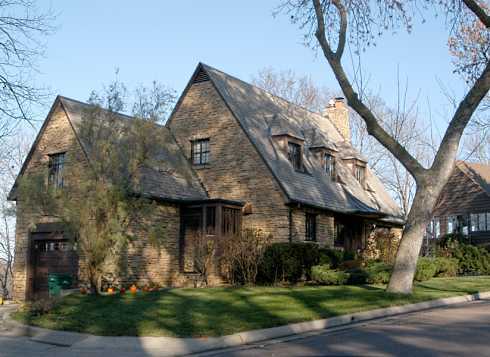 The 1920s Tudor Revival cottage pictured below is located in Indianapolis, Indiana, USA. It features a picturesque combination of stone and brick on its exterior. Geographic location also played a significant role in the architectural design and building materials used in construction. For example, an abundance of stone in England's hilly Cotswold region made it the number one choice of cottage builders and dwellers for centuries. The Cotswold-inspired design that follows is located in Mankato, Minnesota, USA. The beautiful English-inspired stone cottage style home pictured below is of relatively recent origin. 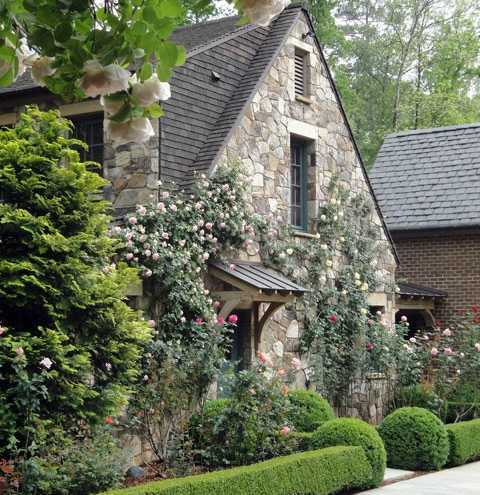 Located near Atlanta, Georgia, USA, landscape architect Richard Anderson further enhanced the look and feel with a cottage garden that includes a profusion of climbing roses clinging to the stone facade and cascading over the covered entry way. The masterpiece of 1920s or '30s period architecture that follows is located on Lake Michigan in Winnetka, Illinois, an affluent suburb north of Chicago. More manor house than cottage, due to its size, it, nevertheless, employs a considerable variety of cottage style detailing to feature it here. Having seen this home, myself, several years ago, it is every bit as impressive as it appears in the photo below! 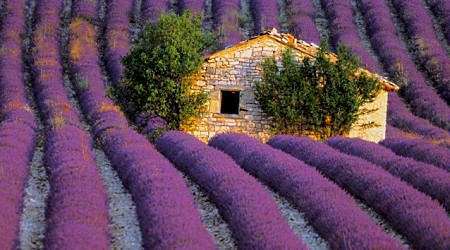 At the end of World War I, Americans romanticized the traditional French farmhouse and created a style known as French Normandy. Clad with stone, stucco or brick -- alone or in combination -- these cottage style homes often resemble, in part, the English Tudor style with decorative half-timbering. As shown in this example, the French Normandy style is frequently distinguished by a round stone tower with a conical roof. Also note the "sag" or "crook" in the slate stone roof -- a construction detail often employed in American cottage style homes to help give them an age-old appearance. 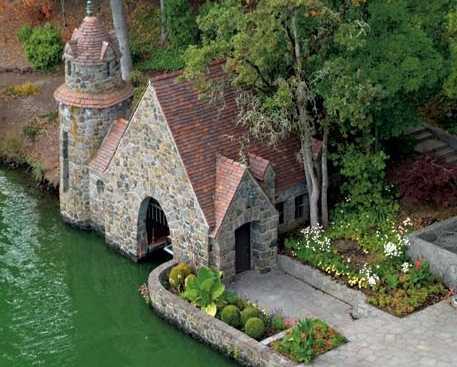 American boathouses of the 1920s and '30s were also heavily influenced by European cottage style architecture. The picturesque design that follows features a romantic stone tower capped with little dormers on its cone-shaped roof. 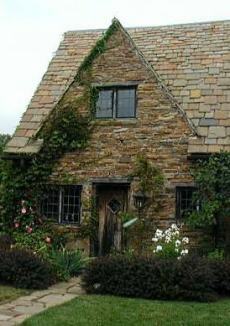 The unusual bungalow style stone cottage pictured below was clearly influenced by English cottage design. Located in the Hyde Park area of Cincinnati, Ohio, USA, it features half-timbering above the upper story windows and a distinctive wood shingle roof designed to emulate a thatched roof. And finally, the remaining stone cottages featured here also appear to have come from the British Isles. Located in Carmel-by-the-Sea, California -- a haven for Storybook Style cottages -- they appear to be quite authentic in design. 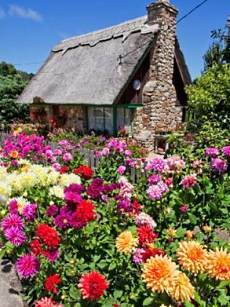 The example pictured at right includes a thatch roof and an English cottage garden. 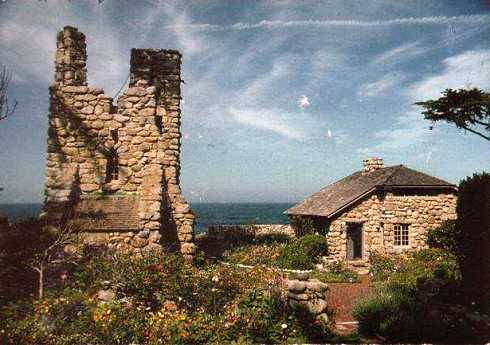 The stone cottage pictured below, right, is known as "Tor House" and was begun in 1918 by poet Robinson Jeffers. In 1920, he began work on "Hawk Tower" (below left), a romantic pile reminiscent of ancient Irish stone towers. Both Tor House and Hawk Tower are open to the public today. 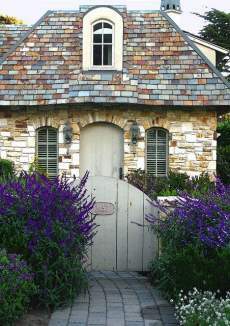 See More Storybook Cottages in Carmel-by-the-Sea!